"Wow, you’re the real deal!” this kind of praise is what Canada's JUNO-nominated Jazz vocalist Heather Bambrick consistently receives from fellow musicians. Critics love her, as well. “Heather hits every right note”, says Mark Rheume of CBC Radio. WholeNote Magazine calls her “one of the finest jazz singers in this country”, and All About Jazz says her voice is a “paragon of clarity” and that “she’s the real deal in every way”. When Anita O’Day first heard Heather Bambrick sing, the Jazz vocal legend exclaimed “You’re good! You should have your own show!” After inviting Heather to jam with him, renowned Jazz- fusion guitarist Larry Coryell said to her “Wow, you’re the real deal!” To this day, flugelhorn icon Guido Basso calls Heather his favourite singer. As one of Canada’s top Jazz vocalists, Heather has collaborated with some of the best around, including Phil Nimmons, Fred Hirsch, Gene DiNovi, Guido Basso, Lea Delaria, Anne Hampton Callaway, Carol Welsman, Jackie Richardson, Ian Shaw, as well as the late Rob McConnell and Peter Appleyard. She’s a founding member of vocal ensembles The Beehive Singers and Broadsway, and has appeared as a guest performer with various Jazz ensembles, as well as with the Toronto Symphony Orchestra, the Newfoundland Symphony Orchestra, and the Windsor Symphony Orchestra. 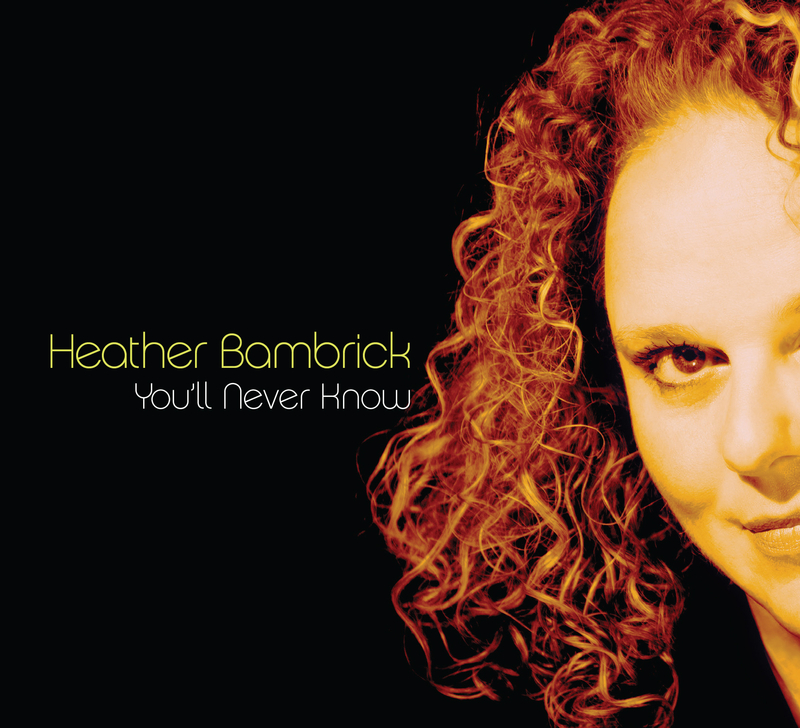 "You’ll Never Know", was nominated for Vocal Jazz Album of the Year at the 2017 JUNO Awards (Canada’s version of the Grammy Awards) and Jazz Recording of the Year at the 2018 East Coast Music Awards. It’s been praised by critics and industry leaders, and has risen to the top of Canadian Jazz radio charts. Heather’s been a guest artist on numerous diverse recording projects, from those of the Caliban Bassoon Quartet, to Sophisticated Ladies (the final recording of Jazz great Peter Appleyard), and Just Passing Through (the award-winning recording from Jeff and Don Breithaupt). She’s been honoured with Canada’s National Jazz Award for Vocalist of the Year. Part musician, part storyteller, part comedienne, Heather is more than just a singer. She is an entertainer in every sense of the word!